FREEDIVING has been around for thousands of years but as a sport it’s a relative newcomer. Divers compete by packing their lungs with air, holding their breath and plunging to the bottom of the ocean for minutes at a time. With no oxygen and often no fins, they are lured to extreme depths of inky blackness and empty silence. Pressure builds on their chest, eardrums and sinuses. Their heart slows, nitrogen can affect their thinking and there’s a chance they may black out. At a certain point, they no longer need to swim. They simply sink under the weight of the water. Freedivers push the limits, never knowing how far – or how deep – they can go on a single breath. It’s a journey of self-discovery. Cairns freediver and self-confessed dive junkie Rob Berto has felt the pain and pleasure of pushing himself into the deepest zones and has just returned from The Bahamas where he was part of a hand-picked safety crew at the world’s most prestigious freediving event, Vertical Blue. Held at Dean’s Blue Hole, the world’s deepest saltwater sinkhole, the competition’s home is a lagoon which drops dramatically to 202m a few sandy steps from the beach. It was Rob’s second trip to Vertical Blue, where he was the only Aussie safety diver and saw 24 athletes from 15 countries smash 34 national and three world freediving records. The high point was Kiwi freediver William Trubridge’s astonishing performance. “He bettered his own world record twice,” says Rob, who was Trubridge’s safety wingman for the second dive – 124m in four minutes and 34 seconds. “I was witnessing history in the making and had the best seat in the house,” he says. Rob, 29, pushed a few boundaries himself on the Caribbean island of Roatan, hitting a personal best of 76m in the discipline of free immersion (pulling on a rope to descend and ascend) and 61m without fins. “The feeling of satisfaction is one I will never forget,” he says. The manager of DiversWorld in Cairns has spent most of his working life around the sea – skippering boats, diving commercially and guiding spearfishing adventures. 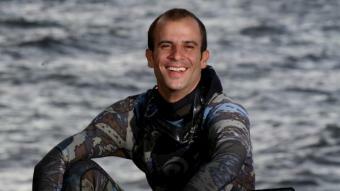 He got his start teaching tourists how to scuba dive and breathe underwater, but developed an interest in freediving when he took up spear fishing. His first freedives were quite short but his mind, body and lungs can now cope with up to five minutes without air. Rob has a daily routine of stretching, yoga, relaxation and warm-up dives before heading into his target dive of the day. “Every day is an ongoing quest to be better and more like a fish, at one with the water. He says freediving has more to do with mind control than age, weight, strength or lung capacity. Increasingly popular, no one understands the pull of freediving more than him.